Oh yes! I've decided that I am going to give away the pattern I use each week for the Sew Weekly challenge. I'm extremely lucky to have an amazing pattern stash (that comes through lots of persistence with the vintage pattern hunting!) and I really want to share it. I love sewing with vintage patterns so much and I know a lot of people would love to give it a try but maybe don't know where to start or are put off by some of the crazy vintage pattern prices (is it me or have they gone up recently...it really does take a good search to get a good deal). My goal is to get as many people hooked onto sewing with vintage patterns as possible! I'll be making a copy of each pattern so I'll still have it in case I want to use it again but this way someone else can have it too! I always wonder what something would look like sewn up by someone else! This is also a good challenge for me to sew with lots of different size patterns and try my hand at grading more (so there will hopefully be lots of different sizes in the giveaways). The only caveat? For those that enter the giveaway, I am only asking that if you do win a pattern that you do not sell it. Keep it as long as you want but when you are ready to move on, pass it along to someone else either as a gift or through a giveaway! One of the things I really love about our sewing community is how generous people are and I definitely want to give back (I've won my share of giveaways and you have all been so wonderfully supportive). There are occasionally weeks that we don't sew from patterns (like the pillowcase week) or there may be weeks when I want to sew with a reproduction pattern (like Wearing History, EvaDress, etc). I'll still have giveaways those weeks--either partnering up with the repro pattern sellers or giving away a previous pattern I've sewn. I get lots of emails asking me where people can find the patterns I use. For those that don't win the giveaways, I'll also be offering a very limited quantity of reproduction patterns each week. We'll see how it goes and how much interest there is for each pattern but I'll probably offer between 5 to 20 a week. I know for those that live in the UK, getting repro patterns can be difficult! I definitely want to eventually open up my own online store and carry some of the U.S. repro patterns (like Wearing History, VPLL, Vintage Fashion Library, New Vintage Lady, Decades of Style, EvaDress, etc.) Because if you live in the UK, it becomes too expensive with VAT and shipping to order more than one pattern at a time (and repro patterns are the easiest way to get some of the amazing 1930's and 40's patterns). So watch this space for more news about this. 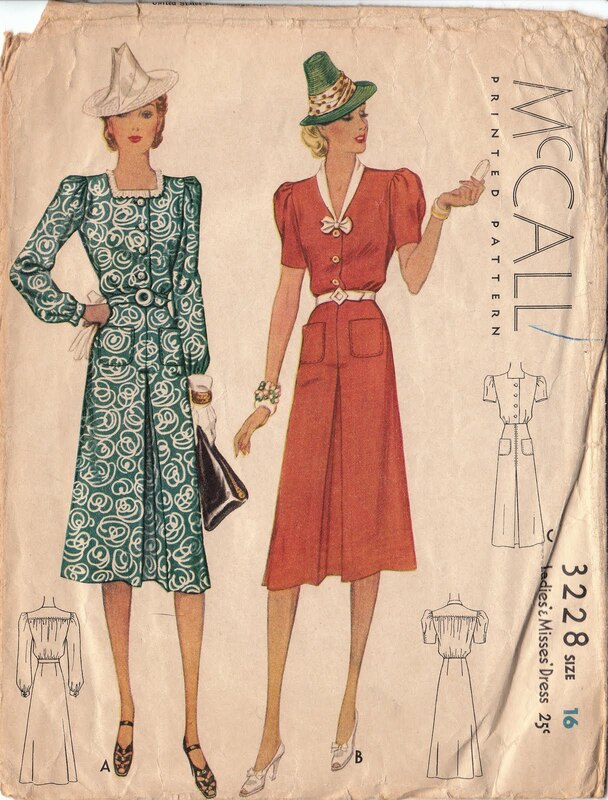 This amazing McCall pattern from 1939. I made view A. Check it out on my blog and the Sew Weekly blogs tomorrow. This will be the first pattern in the weekly giveaways! If you are technologically savvy and connected then post about the giveaway on 1. your blog, 2. twitter or 3. facebook for an additional entry for each method (so you can have a total of up to four entries...be sure to leave a comment and let me know if you've done any of these extra things). I'll announce the winner every Saturday and I'll ship anywhere in the world. Just note that it sometimes takes awhile for packages to arrive for those outside the EU but I'll aim to mail out the patterns by the following Wednesday. If you win a pattern, you can't win again for another six months (but you can enter if you've won one of my previous giveaways as those don't count). And again, keep the pattern for yourself and when you are done, pass it on to someone else! That way we can keep these lovelies available and perhaps get more people involved in sewing with vintage patterns! I really enjoy reading your blog,I don't always leave a comment :O), but I read your new post as I am a follower. Its very generous of you to give away vintage patterns. Or any pattern. However do not enter me in this give away :O), where I love the Vintage dresses I am not really a dress wearing person :O)... I did just buy a Vintage Robe pattern I am very excited about! I am looking for a vintage gown pattern to make to go with it. I bought enough silk to make both the long robe and a long gown! I thought the robe just looked so romantic and I think a beautiful vintage gown to with it would also be so romantic! Good luck to all who enter your give away! Your outfits are always just lovely! this is such an awesome idea! I love that we have to give the pattern to someone else when we're done! My girlfriend and I share our vintage patterns all the time. It's so nice to have a stash between the two of us so we don't have to pay so much for patterns. 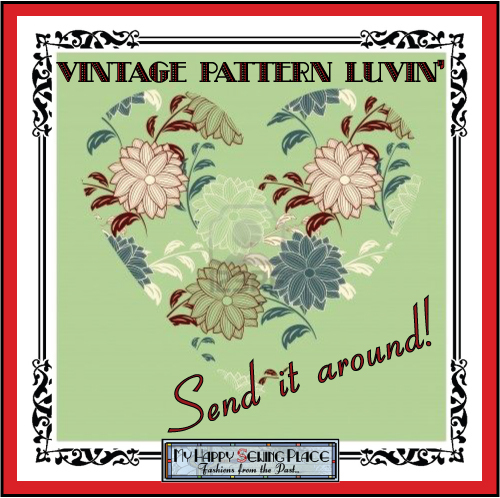 Thank you for such a great chance to win some beautiful vintage patterns! I'm so looking forward to seeing everything you make too. How fun!!! I would love to sew more and I love the pay it forward idea. Count me in. Also tomorrow is my birthday so if I won that would be so cool!!!! Wow, what a fabulous giveaway and what a wonderful person you are :) You are right, some of the prices ARE outrageous. I think your plan of opening your own shop over there is a super one- who knows where this will lead you? I blogged, Facebooked, and Tweeted it for you ;) Here's hoping you get many more followers! That 2nd view is gorgeous! I can't wait until my holidays so I can sew more! What a friendly thing to do! I have been thinking about all the great patterns out there, hidden away and unused....maybe you'll inspire some others to do the same! Yes, awesome, sign me up and I'll make the dress and send it back to you or a person of your choice! Debi, that is so sweet of you.. I love this pattern..So pretty and would love to be signed up for it. Like Vintage girl said, I would love to make it, and send the pattern to the next person on your list..Wouldnt this be fun..That way,you could really see the dress being made ,over and over.Also. I would be glad to pay for the shipping, if I should win one. Thanks for opening this give away for those who are overseas! Debi you are an amazing person with no end to your talents and generosity. I would love to be a part of your give-a-way, and I love the idea of making the dress and then sending it on its way to another lucky person. Wouldn't it be fun to look at where it had been, and it's interpretations at the end of the year? Yay Debi !!! I love all your beautifully made garments! And I am one of those people who always wonder about your lovely patterns. This is so generous of you!!! Hi there! I love this pattern, and I also just posted on Facebook. A great idea and I would love the vintage pattern. I especially love your hooded dress which I'm still searching for one like that. Wow! What a lovely idea. The pattern is gorgeous, I just checked out your dress at Sew Weekly and it's stunning. I love the rose trim. Fantastic idea! You're so right - I'd love to get into sewing vintage patterns but have no idea where to start! What a wonderful idea. You are so generous. I would love a chance to win. Thank you. I love it! Both the dress and the concept of passing the pattern along. Ooh, love the red option, and what about those jaunty little hats! Great giveaway and goes without saying, great blog!! Gosh, I love your idea about a pattern shop for US patterns - I was hit by import tax on the last lot I bough, with shipping etc it took 3 repro patterns to about £50! eek! And what a generous give away, thanks! Great idea Debi! So lovely to share! Oh my gosh! Such a neat and generous plan. Count me in! Your creations are always so inspiring and I'd love a chance to take a stab myself! Such a great idea and I love the idea of sharing and passing on. That is what vintage really is about. The dress is lovely, too, and on top of that, the right size! :) Best of luck with setting up a shop - that's great news for us EU citizens! Ooooh! Love the idea!! :) I definitely have to do a giveaway myself!!! :) And as Arcadia said "great news for us EU citizens!" finding vintage patterns in France is just a nightmare! How generous of you, Debi!! Debi, besides being gorgeous and talent, you are so sweet and generous ! good for you ! You're so lucky to live in Scotland! Thanks for your generosity too. I visited Scotland, where my grandpa was from, many years ago, such a fun place. This first pattern is just darling, I love it! I'll be announcing your giveaway on my blog--too bad I don't have a big readership yet, but I'm working on it. What a lovely dress you made from this pattern. I would love to have a chance to sew view B! What a great and generous idea. And you picked such a beautiful pattern. What a lovely idea, I'm sure you'll have a lot of interest, not least because you do such a great job with your sewing that it is very inspiring to others who want to start working with vintage patterns. I know what you mean about the prices, anything pre-1950s seems to be crazily priced. I definitely want to try a pre-50s pattern but the prices put me off! I have never won an online giveaway, but I am hoping this time is different. That dress is wonderful! I can't wait to see what you do with it. Oh wow--I'll try my luck. Thanks so much for starting this; the sentiment is really lovely! Debi, what a lovely and generous idea. Don't enter me for this one, but you can be sure I will be checking back next week! What a great idea! Thanks so much for the chance to win! Hi Debi, I think it is fantastic that you are giving away your patterns. Being so far away though I would not expect you to post to NZ. You have inspired me to start my own vintage pattern collection! By the way, I love the new banner on your blog page, and the Singer logo is incorporated beautifully. A very pretty pattern. I love the look of view B with the red and white colour combo and the little bow at the front. I would love to try this pattern. I can't believe what a gifted seamstress you have become in only two years! It took me years and I'm still making mistakes all the time! It's very kind of you to pass along the vintage patterns. I find old patterns inspiring with their attention to detail and interesting finishing touches. I love your idea of passing on pre-loved patterns! 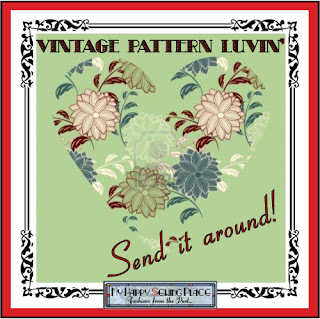 I would love to get my hands on one of your vintage pretties, so please enter me. Thanks! I've never sewn a vintage pattern before but would love to give it a try.